Hiss N Vinegar, ridden by Phil Hanson. Ted Petit Photography. Hiss N Vinegar, winner of the Super Stakes Open Semi-Finals on Friday, with 220 points under Phil Hanson, stepped up seven notches on Saturday with a 227-point championship win in NCHA Kit Kat Sugar Super Stakes Finals. Sugrspiznevrthingniz scored 221.5 points for the reserve championship with Matt Gaines, while Metallic Curveball placed third with 220.5 points under Jesse Lennox. Owned by her breeders, Jeffrey and Jennifer Foland, Weatherford, Tex., Hiss N Vinegar LTE $149,727, by Dual Smart Rey, made her debut in the NCHA Futurity, where she tied for seventh place in the Open Finals. Prior to the NCHA Super Stakes, her only 2019 earnings came as a finalist in the Arbuckle Mountain Futurity. Sugrspiznevrthingniz, ridden by Matt Gaines. Ted Petit Photography. This is the second 2019 major 4-year-old reserve championship for Sugrspiznevrthingniz. Earlier this year, the sorrel mare, sired by Kit Kat Sugar and owned by Jim Vangilder, Weatherford, Tex., was reserve in both the Arbuckle Mountain and the Bonanza 4-Year-Old Open Finals, and also earned money for first-place in the Novice divisions of both events. 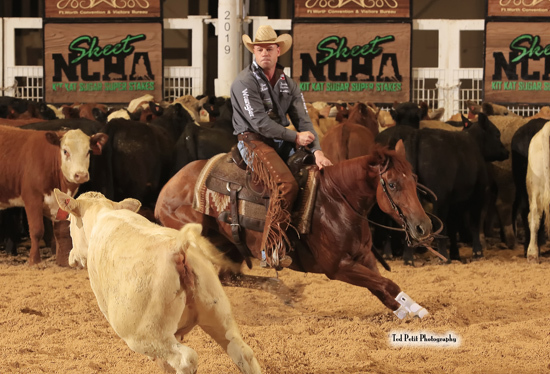 Metallic Curveball LTE $72,201, by Metallic Cat, had earned $8,750, as a finalist in the 2019 Cattlemen’s Derby, prior to the NCHA Super Stakes. 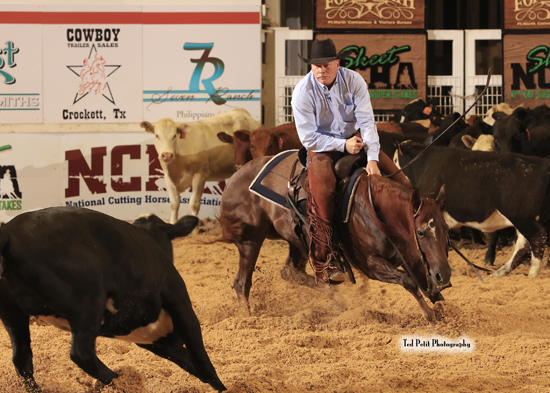 Owned by Rocking P Ranch, Fort Worth, Tex., Metallic Curveball is a half-brother to Cinca Im Hot LTE $193,499, by Spots Hot, third-placed finalist, with Jesse Lennox, in the 2019 NCHA Futurity Super Stakes Classic.